Yeah, that’s pretty much what I kept asking myself while I unwrapped Sega’s Let’s Tap for the Wii . By placing the Wii Remote on a box and tapping the surface, the Wiimote’s accelerometer miraculously picks up on the vibrations and translates them on-screen. It’s a novel idea, sure, and I’m astonished that it actually works. I’ve finally replaced Wii Sports as my party game when friends are over and the girls are sick of the boys shooting aliens all night drunk on Pabst. With only five mini-games (Tap Runner, Silent Blocks, Rhythmn Tap, Bubble Voyager, Visualizer) the game can get old in a short amount of time, but the control scheme is actually what kept me playing and not what was happening on screen. How the hell does this thing actually compute my drunken taps on a box into appropriate actions on screen? I don’t get it! Well, I do and I don’t. 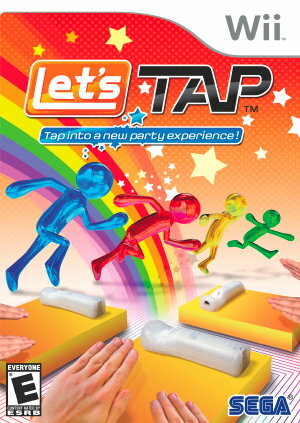 Tap Runner was the clear winner of the five mini-games. As Rowan Atkinson’s character in Rat Race would say, “it’s a race.” Challenge three others to a race riddled with obstacles in the hopes of being crowned the best drunk gamer in all the land. But, seriously, Let’s Tap is surprisingly well put together and utilizes the mechanics of the Wii system like no other and that includes Nintendo . Kudos to Prope and big ups to Sega for only wanting to charge $30. I give it two thumbs up and suggest you pick it up as well. Not everyone wants to flail around like a jackass trying to hit a baseball or tennis ball and some folks shouldn’t be allowed to touch fake musical instruments either. Just sayin’.